Click here to download our handy 4 page booklet, Preserving Your Family's History in Print & Online. It's an Acrobat PDF file, suitable for laser or inkjet printing, or for viewing online. Although publishing seems like the last step in the process of creating a family history or memoir, we recommend that you show us your text and illustrations as early as possible in the process. This gives us an opportunity to discuss what kind of paper to use, what printing process is most appropriate, how many illustrations to use and whether they'll be in color, how the finished product will be bound, and of course, how much all of this will cost you. Working this all out up-front with us can save you from cost or format surprises later in the process, and give us a feel for styles and approaches that appeal to you. We have found that this leads to a more successful process, and a more successful outcome for us both. What's the Final Product? How long is the text likely to be, and how many graphics will be included? Do you hope to produce a nicely bound book, a photocopied booklet, or perhaps a picture book with text? Or, for that matter, is a written family history the best approach for you? Would a family newsletter or website be more realistic, and equally as satisfying? Or a combination? We can help you decide. Who's Included? Do you intend to write mostly about just one particular relative? One couple and their family? Two or three generations of one side of the family? The whole clan, both sides? In short, what's your focus? Who's the Audience? Are you writing just for the family, or also for the community beyond the family? Are you writing for the adult readers in the family, or do you want it to appeal to teenage readers or even children as well? You choice of audience will inform and help shape our editorial and design work. What's Your Style? Most family histories are written using a chronological style, a topic style, or a combination of both. Some prefer to intertwine the two, going through the phases of an ancestor's or family's life, and covering the different topics - such as hobbies, health, and friendships ­ within each timeframe. Another popular approach for profiling couples is the "his story, her story, their story" approach, where you open with their marriage and then alternate between their respective childhoods, until you return to them together. Our work complements and enhances your style. In the end, you want to have a story that will be easy for readers to enjoy. A thoughtful text, complimented by a varied selection of photographs will tell your story, and delight your audience. If you develop an organizing system early and stick to it, the writing and the publishing process will be relatively painless. In addition to word-processing files, a system for tagging photographs to the text and captions will save time and cost in production. A table of contents, index, and source citations should be included, to make it easy for readers to find those people and events of interest to them - and for future researchers. If you include illustrations - and ideally, you should - be sure to provide detailed captions. Photos, pedigree charts, maps, and other illustrations can make your family history all the more interesting. Take the time to make sure the reader will understand the importance of each illustration to the story you are telling. 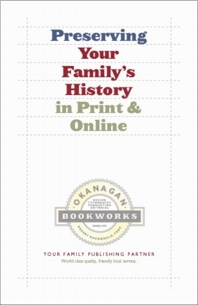 Okanagan Bookworks specializes in limited edition publishing, which is perfect for memoirs and family histories. We work with you at every stage of your project, from your draft manuscript and photographs through editing, design, and publishing. You can order as few as 100 copies for your first run, and order another batch later at the same cost per book. Perfect binding is the most common way to bind paperback books. A heavier paper cover, printed in full colour and laminated on the outside, is glued to the spine of the book block. An economical choice when budget is a consideration. Plastic or wire binding are popular, economical options. The books lie flat, but lack a spine for display on a bookshelf. Often used for cookbooks, and for family histories containing a collection of favourite recipes. Hardcover binding is the most permanent option, and most often chosen for family histories. The pages are sewn and glued, bound into a heavy board with cloth-like binding material, which is stamped on the spine (or a label affixed) with the title. A dustjacket is added, usually in full colour and laminated. The Costs of Your History. Because costs vary from project to project, it is difficult to provide a concrete per-unit cost without seeing the text and graphic materials that will be used to make the book. We always examine your entire project and quote a package price up front, which is dependent on scope, number of photos, difficulty of editing and design, and production considerations. Editing: $30-40/hour, depending on complexity and tasks. Design: $5-10/page, plus photos $10/scan. Photographs are grayscale and incorporated into the text. Color photographs are usually bound as a separate signature to reduce printing costs. The cover is extra, and the cost varies depending on your requirements. Printing: $15-20/copy for 100 copies of a 192 page 6x9 inch hardcover book, text and photos in black ink only, with full color laminated jacket. You can always have more books printed at a later date, at the same price. Books are printed on high-resolution short-run presses, to ensure quality reproduction of your photographs and text. Family Archive Website: $1200. A permanent online presence, which includes site search, guestbook, comment pages, visitor stats, promotion to genealogy, history, library, and book sites, and to search engines. Less expensive options are also available. A Book about a Mother. Celebrating a life well lived, a person well loved. A heartwarming tribute to the family matriarch. 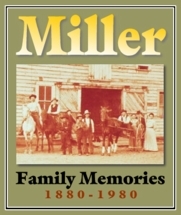 Family history books like this provide a lasting momento of people and places, and are the perfect way for a family to preserve its memories for generations to come. For text and cover samples, and a description of the design and production, click here.